For other uses, see Wrench (disambiguation) and Spanner (disambiguation). A set of metric spanners or wrenches, open at one end, box/ring at the other. These are commonly known as “combination” spanners. In Commonwealth English (excluding Canada), spanner is the standard term. The most common shapes are called open-ended spanner and ring spanner. The term wrench is generally used for tools that turn non-fastening devices (e.g. tap wrench and pipe wrench), or may be used for a monkey wrench - an adjustable pipe wrench. In North American English, wrench is the standard term. 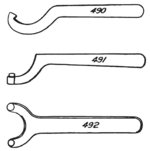 The most common shapes are called open-end wrench and box-end wrench. In American English, spanner refers to a specialised wrench with a series of pins or tabs around the circumference. (These pins or tabs fit into the holes or notches cut into the object to be turned.) In American commerce, such a wrench may be called a spanner wrench to distinguish it from the British sense of spanner. Higher quality wrenches are typically made from chromium-vanadium alloy tool steels and are often drop-forged. They are frequently chrome-plated to resist corrosion and for ease of cleaning. The word can also be used in slang to describe an unexpected obstacle, for example, "He threw a spanner into our plans" (in U.S. English, "monkey wrench"). Wrenches and applications using wrenches or devices that needed wrenches, such as pipe clamps and suits of armor, have been noted by historians as far back as the 15th century. Adjustable coach wrenches for the odd-sized nuts of wagon wheels were manufactured in England and exported to North America in the late eighteenth and early nineteenth centuries. The mid 19th century began to see patented wrenches which used a screw for narrowing and widening the jaws, including patented monkey wrenches. 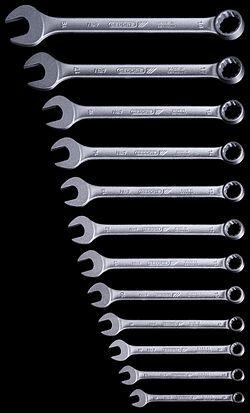 Most box end wrenches are sold as 12 point because 12 points wrenches fit over both 12 point and 6 point bolts. 12 point wrenches also offer a higher number of engagement points over 6 point. However, 12 point wrenches have been known to round off 6 point bolts as they provide less contact space. graduated wrench ? An adjustable wrench with a small number (usually 2–4) of discrete sizes. This is sometimes used as an inexpensive substitute for a monkey wrench. These types of keys are not emically classified as wrenches by English speakers, but they are etically similar in function to wrenches. 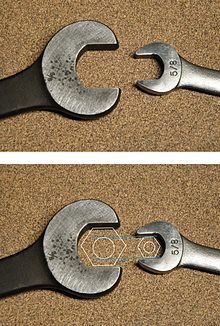 Two wrenches, both nominal size ​5⁄8 in, with a diagram superimposed to show the logic that allows them both to be labeled the same when their actual sizes are clearly different (across-flats distance vs screw diameter). The larger wrench in this photo is from the 1920s or earlier; its face was polished to allow the size stamp to be visible in the photograph. Size is usually designated by dimensions such as across-flats distance (inscribed-hexagon size). In the 19th and early 20th centuries, it had been common to define the nominal size of the wrench according to the nominal size of the screw thread that it was meant to be used with. Modern practice uses a size designation based on across-flats distance, whether measured in metric or in inch units. ^ "AskOxford". Archived from the original on 2004-10-18. Retrieved 2010-04-20. ^ "Undoing stripped nuts with 6 point wrenches". rtstools.com. Archived from the original on 2017-09-30. Retrieved 2017-09-30. ^ "McMaster-Carr Catalog". www.mcmaster.com. McMaster-Carr. Archived from the original on October 9, 2016. Retrieved October 10, 2016. ^ "Drill Chuck Keys & Keyleashes". Retrieved 13 April 2016. ^ "World Wide Words: Church key". World Wide Words. Archived from the original on 6 May 2018. Retrieved 13 April 2016. Spanner Jaw Sizes Additional background information and spanner jaw size table.